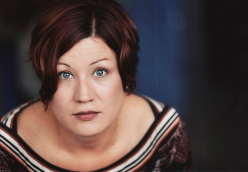 Meg is a director, choreographer, instructor, designer, and performer of theatre, music, and dance. Hailing from the ‘burbs of Detroit, she received a BME with honors (K-8 General Education, K-12 Music) from Central Michigan University while performing and working in the University Music and Theatre Departments. She served as performer and staff for Highlands Playhouse (Actor/Musician/Dancer, Box Office Manager, House Manager, Instructor of Children's Theatre) and Vision Studio of Performing Arts, Inc. (Artistic Director/CEO 2000-2004; Ballet Director 1996-2000; Instructor of Theatre, Music, and Dance) and began working as a freelance artist in Chicago in 2004. Meg has worked in various genres and organizations in Chicago, such as Director, Choreographer, Production Manager, Stage Manager/Board Operator, Actor, Musician, Costume Designer, Properties Designer/Set Dresser, Sound Designer, Ensemble Member, and Associate Artistic Director (2005-2007) with BackStage Theatre Company; Managing/Marketing Director (2006-2007) and Instructor of voice, piano, musical theatre, and early-childhood music with Chicago Center School of Music; Director/Instructor of Ballet and Chorus with Chicago Public Schools; Director/Instructor of Musical Theatre for Francis W. Parker School- ParkerPLUS; Administrative Director/Assistant Principal and Admissions Coordinator at Lake Shore Schools; Cantor, Soloist, Catechist, and Youth Choir Director at St. Gregory the Great Catholic Church; Choreographer/Vocal and Movement Coach/Instructor of Musical Theatre for University of Chicago Laboratory School- SummerLabOnStage. She continues to reflect on the training offered by wonderful artists and mentors such as Steve Berglund, Dr. Tim Connors, Dr. Rhona Justice-Malloy, Lynnae Lehfeldt, Dr. August W. Staub, Linda Talcott-Lee, Sam Williams, Ann Reinking (Theatre/Musical Theatre); Pat Salerno, Linda Giancaspro Palma, Bril Barrett, Lane Alexander, Susan Filipiak (Dance); Mary Kiesgen, Dr. Nina Nash-Robertson, Dr. Robert Mirshak, Cora Enman, J.Timothy Caldwell (Vocal); Pierre Toucheque, Patricia Willwerth, Dave Zerbe (Piano/Percussion); Barbara Conable (Alexander Technique); J.Timothy Caldwell (Dalcroze Eurhythmics). Organizations and honors include Alpha Psi Omega, American National Theater Honors Fraternity (Collegiate President and Vice-President), Sigma Alpha Iota, International Music Fraternity for Women (Collegiate President and Vice-President; Alumnae Charter Member), Golden Key International Honour Society, American Choral Directors Association, and American Guild of Music. Meg's favorite artistic experiences include directing Zombies from the Beyond with BSTC, performing CONNIE in Good News with Director August W. Staub, performing BEBE in A Chorus Line with Director/Choreographer Linda Talcott-Lee, and an intimate Master Class with Tony-award winning Ann Reinking. A passionate "life-long learner", she loves teaching and continuing self-growth in the performing arts. Meg is proud to share her work and life with her husband, Sean, daughter, Saoirse, and dog, Beau. Sean is a performer, carpenter, stagehand, and instructor of theatre, music, and television. He hails from Ohio, where he earned a BA in theatre from The Ohio State University and performed and worked for Cleveland Public Theatre, Dobama Theatre, Great Lakes Theatre Festival, and Porthouse Theatre. He began working in Chicago in 2002 and has held various roles in the performing arts. Sean has appeared on stage in Chicago as JOHNNY CASH in the Million Dollar Quartet, Chicago cast (Tony Award Winning musical and Equity Jeff Award Nominated); with Shattered Globe as HARLAN ‘MOUNTAIN’ McCLINTOCK in Requiem for a Heavyweight (Equity Jeff Award Winning and Equity Jeff Award nomination for Outstanding Actor in a Principle Role for his portrayal); Lifeline Theatre as M’LING in The Island of Dr. Moreau (Jeff Award Winning); Timeline Theatre as FLOYD in Fiorello! (Jeff Award Winning) and as JOE in The Children’s Hour (Jeff Recommended); BackStage Theatre Company as HENRY ANTROBUS in The Skin of Our Teeth (Jeff Award Winning), as ROALD AMUNDSEN in Terra Nova (Jeff Recommended), and as McKYLE, the God of Electricity, in The Ruling Class. He can be found playing his guitar and singing throughout the Chicagoland area as a founding member of the Blue-Irish-Folk-Grass band, One of the Girls (www.oneofthegirls.net). Sean’s television credits include Boss (S2, E2 "Through and Through" as CHAPLAIN, opposite Kelsey Grammar ) on STARZ; The Beast (S1, E10 "Tilt" as ANTHONY, opposite Patrick Swayze) on A&E; Chic﻿ago Fire (S1, E16 "Viral" as BOMB SQUAD TECH); ﻿Chicago PD﻿ (S1, E13 "8:30pm"and S3, E7 "A Dead Kid..." and E14 "The Song of Gregory Yates" as BOMB OFFICER SULLIVAN) on NBC; Crisis (S1, E1 "Season Premiere"-S1, E8 "How Far Would You Go?" as CREEPY GUARD, opposite Dermot Mulroney) on NBC; Empire (S1, E6 "Out Damned Spot" as SECURITY GUARD, opposite Taraji P. Henson) on FOX; In An Instant (S1, E3 "Grizzly Attack" as JIM KNAPP ) on ABC; The Rosie Show (aired 12-6-11 as himself/FEATURED GUEST, opposite Rosie O’Donnell) on OWN. Sean is a freelance scenic carpenter and stagehand in theatre and television. He has worked for companies such as Harpo Studios, Inc. (The Oprah Winfrey Show on ABC from 2005-2010 ; The Rosie Show on OWN from 2010-2011; Wanda Sykes' Herlarious on OWN in 2013; Oprah's Super Soul Sunday, Iyanla: Fix My Life, and Oprah's Life Class on OWN from 2013-14), Chicago Scenic Studios, Inc. IATSE Local #2 (The Sound of Music at Lyric Opera and The Steve Harvey Show on NBC in 2014), Stage Mechanics Union Local #676 at Chicago Studio City (Betrayal on ABC in 2013), and Cinespace Studios (Empire on FOX in 2014). Sean has also been an ensemble member with BackStage Theatre Company since 2004-2015, serving as an Actor, Master Carpenter, Scenic Designer, and Technical Supervisor. Sean is a member of the Actor’s Equity Association and Screen Actors Guild/American Federation of Television and Radio Artists. He is also represented by Stewart Talent Agency. Sean takes the most pride in having met and married SCSPA partner and best friend, Megan Sullivan.